Tomb of a Rouran princess, Yujiulu Chidilian, and her Chinese husband Xu Xianxiu, 550 AD. Yujiulu Chidilian died when she was 13 years old. About 300 AD, a group of Turkic or Mongol people called the Rouran formed a kingdom in Central Asia. They called their leader the Khan. The Rouran included people from a lot of different ethnic groups, but their leaders were Mongols. At first the Rouran controlled the White Huns, a large group living to their west, as well. 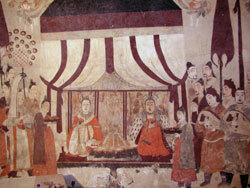 By about 400 AD the White Huns broke away from the Rouran Khaganate and started their own kingdom. The Khan Anagui came to power in 519 AD. In 552 AD, the Chinese Wei and Qi kingdoms decided to get rid of the Rouran and stop their attacks on China. The Chinese teamed up with a Turkish group, the Gokturks, and this alliance destroyed the power of the Rouran. In their place, the Gokturks started their own kingdom, with their own khan. Some of the Rouran’s subjects, the Avars, eventually moved west to Russia to escape the Gokturks. Cite this page: Carr, K.E. Rouran – Medieval Central Asia. Quatr.us Study Guides, May 31, 2017. Web. April 24, 2019.